There are several train providers across the UK & Europe. 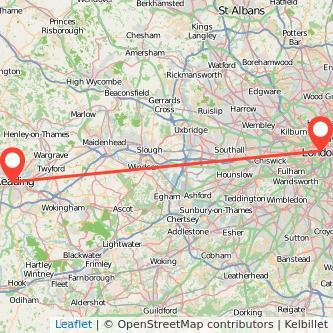 By searching for your ticket using our travel search engine, you will be able to see the trains connecting London in England to Reading in England as well as the train operator for this journey. The train is a fast and simple solution to travel to Reading from London. The average train duration between London to Reading is 0h33m to travel the 37 miles. Depending how long in advance you buy your ticket or the day and hour of travel, the cost of the train may change. Find the cheapest tickets to travel from London to Reading by train, bus, ride sharing and plane. Generally, the earlier you buy your train ticket, the cheaper it will be but there can be some exceptions. We collected the data from the last six months in order to find the best time to purchase your train tickets London to Reading. The figures illustrate that buying your train from London to Reading in advance is not always cheaper. We found tickets at £18 when purchasing your ticket 15 days in advance while you will have to pay a minimum of £20 if you get your seat 1 month in advance. Thus, based on our data, the best time to purchase your seat is 15 days in advance as it is 10% cheaper than 1 month in advance. We compare train ticket for all major companies to travel between London and Reading by train and find the best prices for the coming days. Take a look at the prices of train tickets Reading to London and find the best deal for your outbound journey. National Railcards can save you a lot if you're using the train. Depending on your age and your situation, you are able to get one of the five existing railcards: Disabled persons, 16-25, Two together, Senior or Family and Friends railcards. Railcards can help you pay less for your London Reading train ticket. In our example, A/B = £30/34% = £88.00. Then, 88/£50.00 = 1.76. Your railcard will be worthwile once you will have done at least 2 trips from London to Reading (one way journey).